Lauded by customers for their extreme reliability and extensive product line, IPak develops the industry’s most innovative tray formers and offers a wealth of sealing, stacking and feeding solutions. Among their catalog, the IPak TF-100 has become a cornerstone: an automatic tray former in a compact profile that is manufactured from rugged, heavy duty materials. Including all of the standard features that IPak has become known for, the TF-100 specializes in 4-corner trays, making it an ideal solution for a range of applications, including beverage, pharmaceuticals, electronics and processed foods. In this post, we’re going to take a closer look at the benefits of the IPak TF-100 and, more importantly, discuss how you can explore these benefits firsthand at our upcoming IPak Demo, running from August 29 to September 16, 2016. Designed around IPak’s compact 40" x 80" platform, the IPak TF-100 is an excellent tray forming solution for applications with restricted floor space. Despite its compact size, however, it remains capable of handling a wide range of case sizes. Coming with convenient and easy to understand instructions, the TF-100 tray former allows for quick, accurate size changeovers. Utilizing color-coded change handles, size changes can be performed in under five minutes. 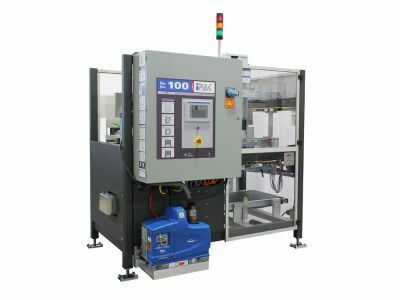 Including the standard positive chain and lug blank advance, Nordson ProBlue hot melt adhesive system, fully-interlocked safety guarding and independently controlled and self-cleaning Venturi-style vacuum packing, the TF-100 can also sport a number of advanced features. Whether you’re interested in increasing the machine’s capacity, adding a monitoring system or implementing remote sensors, the TF-100 can adapt to – and address – your needs. At Technical Packaging Systems, we serve the packaging and material handling needs of nearly every industry in existence. With specializations in several industries, including food, transportation, warehousing, agriculture and product packaging, we have over thirty years of experience in meeting the demands set forth by a range of applications. If you’ve been considering upgrading – or replacing – your current tray forming equipment, be sure to stop by during our Wexxar/IPak demonstration, between August 29 and September 16, 2016.